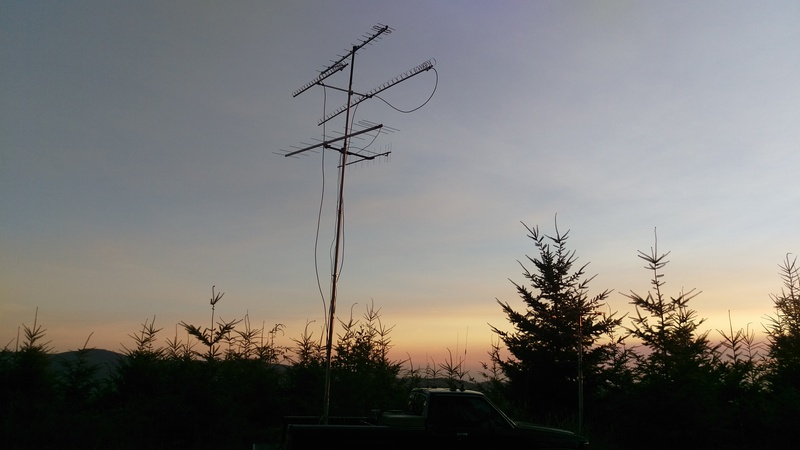 The ARRL UHF contest comes at the most spectacular part of the year in Western Washington. Typically we have pleasant sunny days with highs in the mid- to high-70s, and lows around 60. That isn’t what happened this year. Instead, the weather forecast was for highs in the mid-90. Oh well…at least my old 1988 Toyota Pick-up has wing windows. Post-contest, I can say that the weather wasn’t so bad, and the contest offered great challenges and plenty of fun. On top of the rack is the 1296 MHz transverter/amp/TR switch/sequencer/IF switch. I described this in more detail last year. Below that is the SSB Electronic LT-33S 903 MHz transverter. Below that is a Yaesu FT-857D for 432 MHz (the head is mounted remotely). Below that is another Yaesu FT-857D that is the IF radio for 1296 MHz and 903 MHz transverters (the head is mounted remotely). 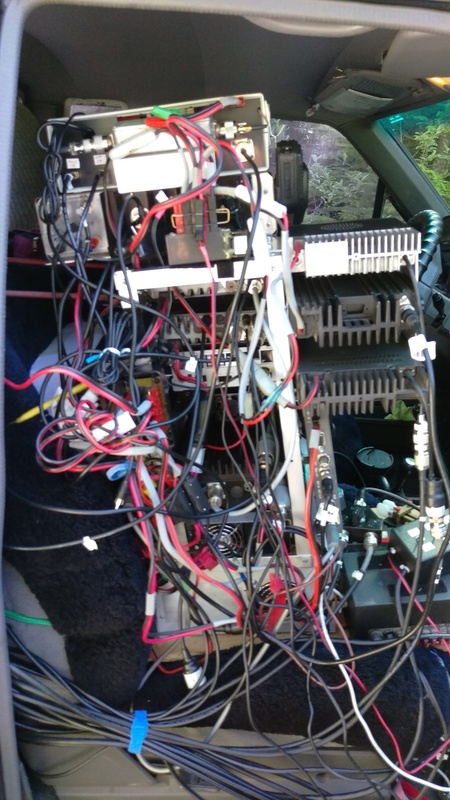 Below that is a Yaesu FT-290R 2m all mode rig for 2m coordination and as a back-up IF rig for 903 MHz and 1296 MHz transverters. Below that is an Alinco DR-590 for 440 MHz FM. Below that is an RF Concepts 4-110 amplifier, 100 Watts on 432 MHz. The bottom of the stack is a Kenwood TS-480SAT used as an IF rig for 222 MHz. Mounted sideways on the right side on top is a Mirage C2512G amplifier putting out 100 Watts on 222 MHz FM. Below that is a 50w 903 MHz amplifier assembly, including the coax attenuator. I described this in more detail last year. On the left side of the rack is a Kenwood TK-981 (12w, 927.5 MHz nbFM). Below that, with a blue display, is a Jetstream JT220M (223.5 MHz FM). Below that, mounted sideways, is an Elecraft XV222 222 MHz transverter. Two rotors control boxes for Alliance HD-73 rotors can be seen above and below the paddle. Atop the upper rotor is a control for the antenna switching relays. For 222 MHz the two antennas are switched between the two rigs/amps. Three other switches are SPDT relays to switch 432 MHz, 903 MHz, and 1296 MHz between the front and rear antennas. Not visible next to that is a mechanical switch to move the 440 transceiver between the front and rear antennas. Behind the passenger seat was a second battery in parallel with the truck battery with the output piped through a power booster. The whole mess can be seen from behind here. The entire rack was secured with several bungee cords around the back of the seat. 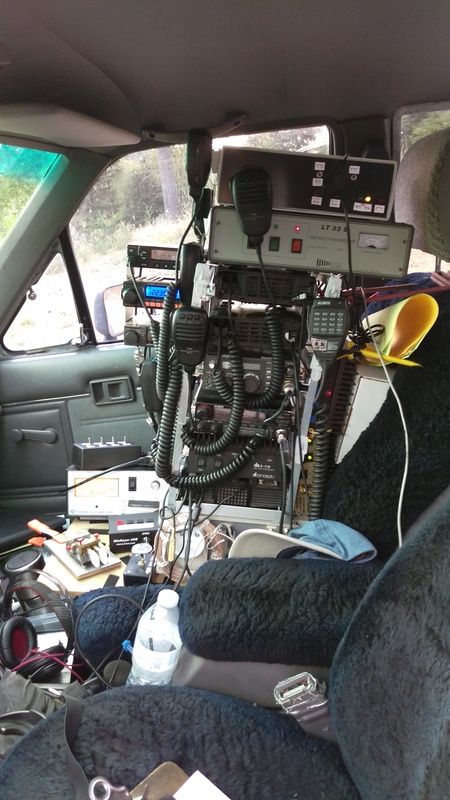 Here is the operating position, with two Yaesu FT-857d heads (432 MHz and 903/1296 MHz) and the Kenwood head (222 MHz). Two old cell phones running GPS Test+ show the current maidenhead grid and a 24 hour clock. This collection of equipment represent a few improvements and changes over last year. First, is the addition of an amplifier to the 223.5 MHz FM radio. At least half of the 22x QSOs are on 223.5 MHz, so doubling the power over the Jetstream’s 50 W is a nice improvement (and the preamp built into the amp is a little help). The second difference was using an FT-857d as the IF rig for the 1296 MHz and 903 MHz transverters. Last year I used the Yaesu FT-290R, which worked okay, but the 857d has modern filters, clean switches, a better display, better tuning and an actual headphone jack. Additionally, the rig interfaces properly with the PTT using CW. With the 290R, I had to hold the PTT switch on the mic when sending CW. Overall, the FT-857d was a huge improvement. The third improvement was a beefier 24v power supply for the 903 MHz 50w amplifier. The Stealth Microwave amplifier runs in class A, making it a power hog. Last year the switching power supply blew an internal fuse halfway through the contest. Finally, I replaced the Alinco handheld that monitored 1294 MHz and 1296.2 MHz FM with the Icom IC-1201 10w mobile rig. The antenna stacks were quite similar to last year’s. 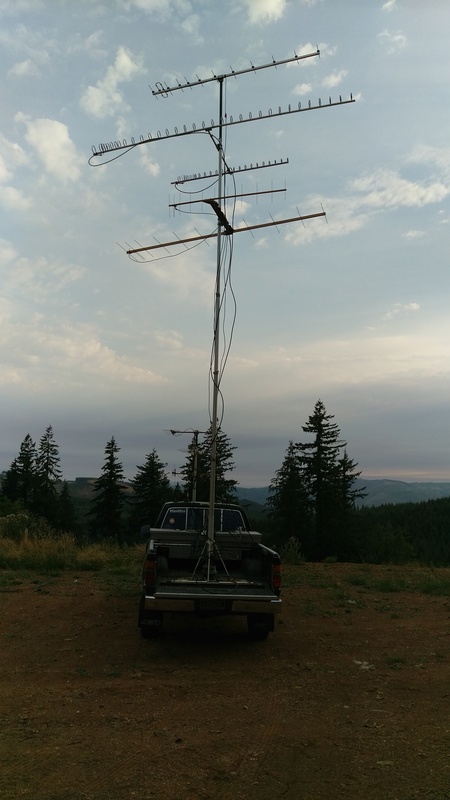 The rear stack covered four “all mode” bands (222 MHz, 432 MHz, 903 MHz, and 1296 MHz), and an additional vertically polarized antennas for 440 MHz FM. The front stack covered everything with smaller antennas that could be rotated in motion. The antennas were fed by seven runs of LMR-240 that traversed the engine compartment, under the chassis and into the cab through a stock hole under the passenger seat. The only real change over last year’s antenna assemblage was a few more elements on the rear 222 MHz yagi. Like the last two years, I intended to hit three primary locations—two grid intersections and one border line. There were minor details in stop locations. 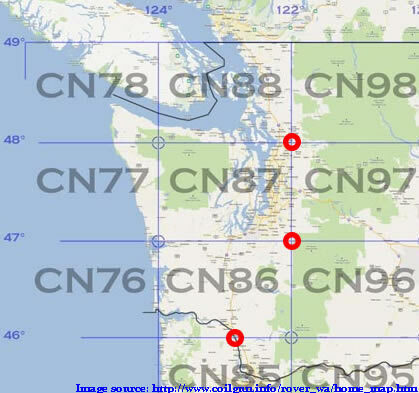 The overall plan was to start out north near the CN87/CN97/CN88/CN98 grid intersection and work my way south to the CN87/CN97/CN86/CN96 grid intersection for Saturday. I would sleep in my truck in a rest area near my last stop for the night, and activate CN85 and CN86 (again) Sunday morning. The contest started off well from Mt. Pilchuck. It always does from this spectacular location. My very first QSO was with Loren, WA7SKT, in a valley way to the south in CN86. One of the surprise QSOs in this location was working WA7FUS on 927.5 MHz nbFM. Before the contest started, I had programmed a bunch of channels with different PL tone encoding, and one of them worked to raise WA7FUS. 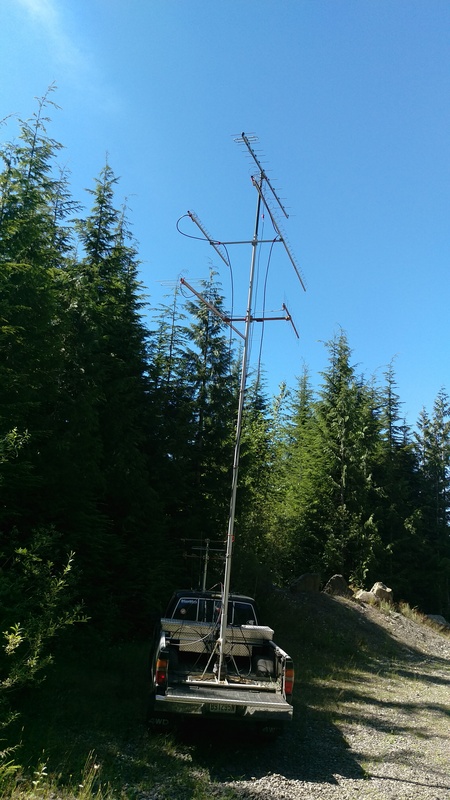 The other nice surprise was working Dale, KD7UO, who was portable at the south end of CN97, on 1296 MHz, and Lisa, N6LB on a nearby mountain in CN98, on one band. We would work on two other bands later in the contest. The final surprise was working Greg, K7YDL, down in Portland, OR, CN85 on 432 MHz. The next stop, in CN88, was productive, but not spectacularly so, as is usual for this low location. The surprise was working seven stations on 1296 MHz (including KD7UO again), but only one on 903 MHz. The next planned stop was in my back yard in CN87 that was pretty much on the way to the next location. One reason was to make sure I could work my friend & neighbor Doug, AC7T, on 222 MHz, 432 MHz and 927.5 MHz. My other intention was to refresh my coffee and grab some food. It also allowed me to pick up a few items I had forgotten (sunglasses) and drink lots of cold water. I had messed up the programming on the K1EL WinKeyer, so I went to reprogram it from my home PC. For some reason the USB port was not properly connecting. I ended up wasting 15 minutes before getting it to work. 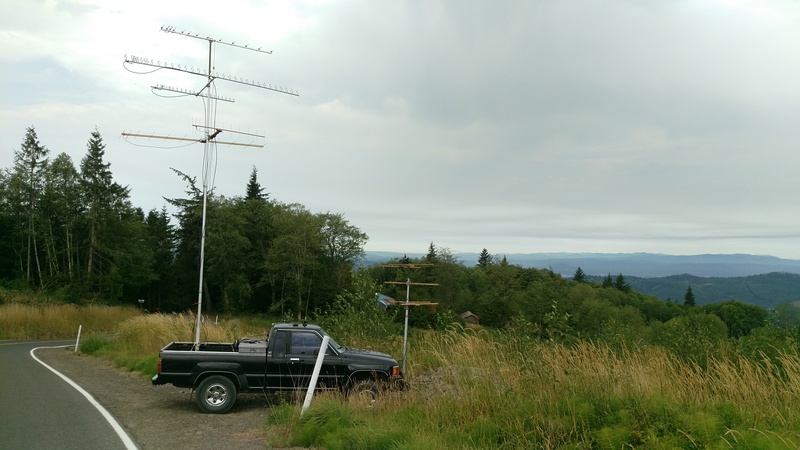 I ended up spending way too much time at home, so I bypassed my next location (a park in Issaquah from which to activate CN97 and CN87 with good reach to the north) and headed to Mud Mountain (CN97). Mud Mountain was modestly productive and I got back on schedule. The last three stops of the evening are on the same gravel road that passes through CN87 then CN86 and then CN96. 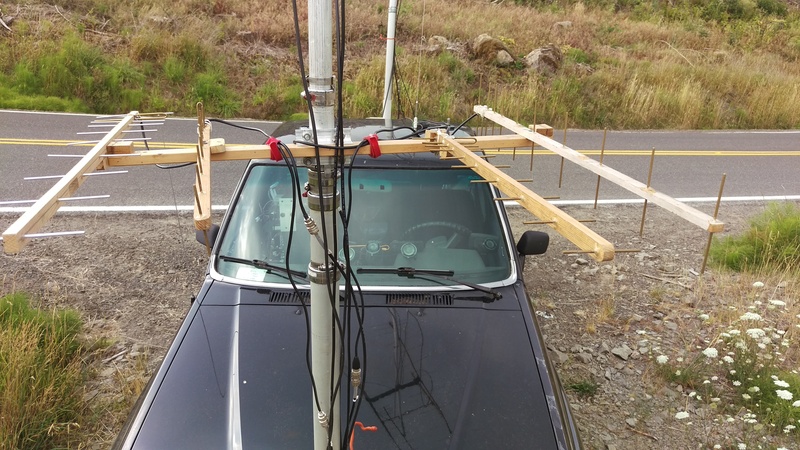 I drove slowly up the gravel road and worked as many people off the front antennas as I could from each grid. 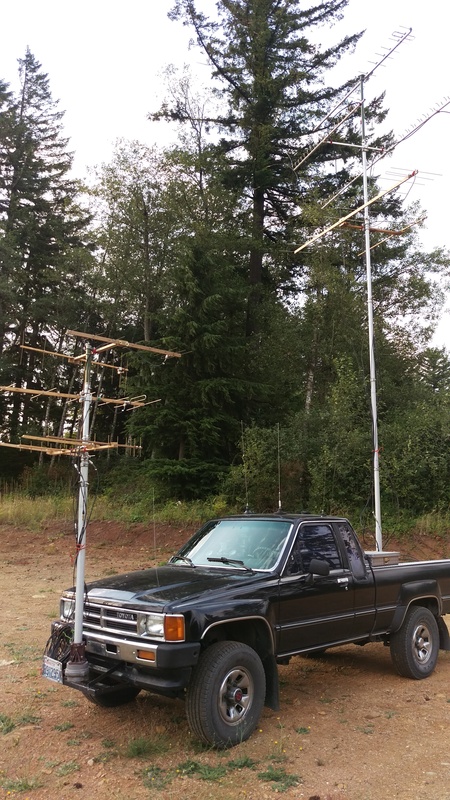 Once in CN98, I set up the rear antennas and worked more systematically than is possible while in motion, and repeated this for CN86 and then CN87. The last QSO of the evening was with Tom, KE7SW, on 927.5 MHz just after midnight while I was heading off to Kelso, Washington for the evening and getting close to his house. We had tried several times to work on 903 MHz from CN87 stops, but it just wasn’t working. The next morning I set up in CN85 near Green Mountain. Most QSOs were back into CN87, including working a number of people on 1296 MHz and 903 MHz. I made a local (CN85) QSO on 927.5 MHz. My longest QSO was with VE7AFZ/R in CN89 on 432 MHz. I was also mighty pleased to work KB7W in CN93 on 222 MHz and 432 MHz. Then something funny happened as I tried to work KE7MSU/R on 927.5 MHz. I heard a short warble tone at the end of my transmission (sort of like a repeater). I looked at the radio and it said “927.5” with TA (=talkaround=simplix) displayed. “I don’t remember a programming option for a ‘roger beep'”, I thought, as I continued calling the other station. Then someone with a 5-land call came back and told me I shouldn’t be using repeaters for the contest. What the…?!? I double and triple-checked the display and, indeed, it said 927.5 and had TA displayed. The other station pointed out that he was in Texas. I was very busy at the time, so I couldn’t debug and figure out what (linked) repeater I was talking on. I verified (for a 4th time) that the display was “927.5” and that “TA” was being displayed, then powered down the TK-981. When I had a few minutes some time later, I powered up the radio and tested it using a handheld radio on 927.5 MHz. It worked as expected. I subsequently made simplex QSOs on the radio. This confused me, so after the contest I emailed the AR902MHz Yahoo group for help. I learned that there was a simplex node in Vancouver, WA connected into the AllStar network. I had never heard of the AllStar network, but with a little post-contest homework, the very confusing mystery was solved. The final stop of the contest was on Green Mountain in CN86, about 15 minutes to the north. Here, again, I worked KB7W (CN93) on 222 MHz and 432 MHz, VE7AFZ/R on 432 MHz as well as 222 MHz, and I worked KE7MSU/R on 927 MHz (without the AllStar problem). Perhaps the biggest surprise was working Scott, VE7FYC, on Hollyburn Mtn. ( 4350 feet ) in CN89. 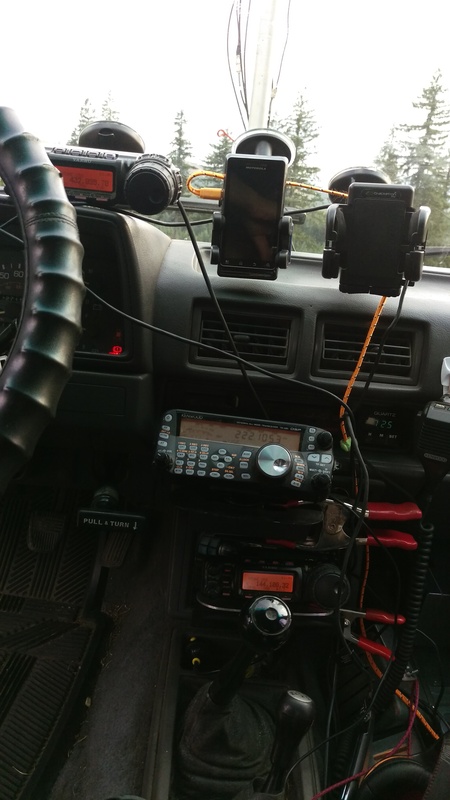 Just North of Vancouver, B.C, on 223.5 MHz FM. He had a solid signal using a hand-held radio—and we were probably cross-polarized. It turns out I was his only contest QSO for the day. In the last moments of the contest, KB7ADO, who I had worked from CN85, on two bands, showed up and worked me on 222 MHz, 432 MHz, and 927.5 MHz. It was a nice way to end the contest. The final (preliminary) score is 28,188, a 25% improvement over last year’s score. Things went quite smoothly this year. The equipment worked well and was trouble-free. It was a good adventure.